The collection includes newly remastered versions of the first two titles in the BioShock video game series—BioShock, BioShock 2—alongside their single-player content originally released as exclusives or downloadable content packs, including BioShock 2's Minerva's Den and BioShock Infinite's Burial at Sea, and for consoles a port of the PC version of BioShock Infinite. Return to the cities of Rapture and Columbia and experience the award-winning BioShock franchise like never before. BioShock: The Collection retells the epic journeys of the BioShock universe beautifully remastered in 1080p. 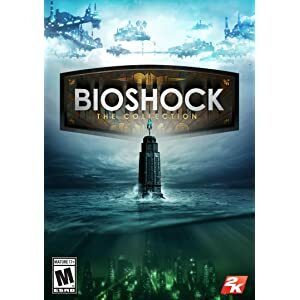 BioShock: The Collection contains all single-player content from BioShock, BioShock 2, and BioShock Infinite, all single-player add-on content, the 'Columbia’s Finest' pack, and Director’s Commentary: Imagining BioShock, featuring Ken Levine and Shawn Robertson.